1. My diagnosis is: Chronic migraines with aura, Vestibular migraines, Menstrual migraines, Persistent migraine auras. 7. My most disabling migraine symptoms are: Vertigo since it does not go away. 8. My strangest migraine symptoms are: Persistent migraine auras, since there are a lot of bizzare visual weirdness going on. 10. I know a migraine attack is coming on when: From the aura. 11. The most frustrating part about having a migraine attack is: The decrease in capacity to function. 13. When I think about migraine between attacks, I think: There is only a small gap to live in and even between attacks migraines affect the brain. Photophobia is a good example of that. Vertigo is another. 14. When I tell someone I have migraine, the response is usually: Oooh sounds like a really bad headache. 15. When someone tells me they have migraine, I think: I feel for you. I really, really feel for you. 18. I find comfort in: hobbies like blogging, writing and reading. 19. I get angry when people say: Migraines are not a disability. 20. I like it when people say: They don’t understand how I could function with such pain, because they grasp the problem. 21. Something kind someone can do for me during a migraine attack is: Be quiet, get me my ice and migraine balm, keep it dark and give me some time to relax. 22. The best thing(s) a doctor has ever said to me about migraine is: Is that even the best preventative would never bring me down beneath chronic at this point, so we needed to add in lifestyle changes. At least he was honest. 23. The hardest thing to accept about having migraine is: The effect on my life, my career and my future. 24. Migraine has taught me: To compromise, to accept my limits, to live in moderation. 25. The quotation, motto, mantra, or scripture that gets me through an attack is: This too shall pass. I repeat that when in severe pain… because That severe painful episode will pass. 26. If I could go back to the early days of my diagnosis, I would tell myself: To get treatment early. That things can get very complex. 27. The people who support me most are: My mom and my spouse. 28. The thing I most wish people understood about migraine is: How complex treatment is. How difficult it is to handle this pain long term. 29. Migraine and Headache Awareness Month is important to me because: To help raise awareness about the affect this has on lives. 30. 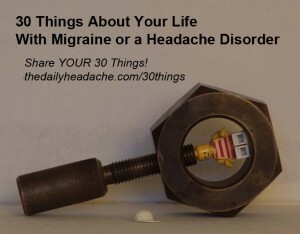 One more thing I’d like to say about life with migraine is: That it is difficult to have a life with chronic migraines. It is living in the pain gaps, when you have them. It is a life by inches.